Also commonly known as the foreign exchange market, forex and FX, currencies are another widely-traded spread betting market that has particularly increased in popularity over the last two years. While the movement between currencies was once the preserve of traders who worked for large investment banks, today there are hundreds of forex brokers that make available online platforms which allow anyone with a bank account to speculate on the movements within the forex markets. However, buying and selling currencies via foreign exchange brokers can be quite expensive as there are normally quite sizeable margins between buying and selling prices. While the likes of George Soros and the legendary Jim Rogers move markets with their huge hedge fund resources, private investors can utilise financial spread betting to prove that size isn’t everything. Spread betting has the advantage of not only gains being free from tax, but also of very tight spreads and this is making this trading instrument increasingly popular. In fact, for foreign exchange trading, spread betting is currently the preferred investment method amongst retail investors and for the year 2010 about 42% of all spread bets comprised foreign exchange trading according to global researcher Investment Trends. Most brokers will use many different liquidity houses to permit them to offer very competitive bid-offer spreads on the main currency pairs. The main currency pairs are usually offer at two or three pips (a pip being the smallest move that a quote can fluctuate). Recently, spread betting providers have witnessed a massive increase in currency trading. A significant amount of that is down to the sovereign debt crisis and the sheer liquidity in the market as traders shift to take a punt on the broader picture. For instance while bond auctions by Spain and Italy should serve to highlight into investors’ confidence in plans to solve the eurozone financial crisis, spread traders have been buying dollars and selling euros as the market turned bearish in 2011. In fact since May 4th 2011 the Euro has lost some 15% against the dollar, falling from $1.4939 to a low of $1.2664 [January 2012]. Unlike stocks, which can be illiquid, there’s always volatility and liquidity out there and there’s always a buyer – in fact the forex market is the most liquid trading market available in the world with over $4 trillion in trades every day. This also means that any kind of price manipulation by market participants is extremely difficult due to the vast size of the market. But what are the Forex Markets? 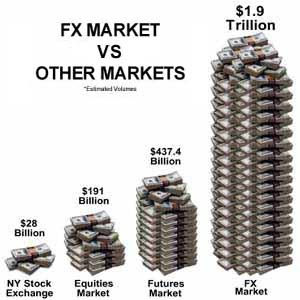 The foreign exchange market or FX is the largest financial market in the world and about $4 trillion is traded every day on the foreign exchange market. In fact there are millions of participants in the forex sphere all with different timeframes and objectives. The $4 trillion represents the sum total of all international trade down to the small-scale conversion of holiday money – although the vast majority of that money represents intraday, speculative trades. That’s even more than all the stock market volume combined on a daily basis, and that goes back to how liquid the currency market is. All of these deals create a volatile market which spread traders can capitalise on. Meanwhile, online trading platforms have exploded – the Internet has made forex trading particularly tempting, since it is so much easier for private investors to track foreign currencies and global monetary policy. Plus, the credit crunch and recent stock market turbulence has private investors giving currencies a fresh look. The biggest foreign exchange market mover remains the USA non-farm payroll, also known as the ‘non-farm Friday’ due to the fact the USA Bureau of Labor Statistics publishes the report on the first Friday of each month. For instance in November 2011 the non-farm payroll data was somewhat below expectations and as a consequence currency traders exited risky currencies back into the dollar just after the release of the figures. The euro/dollar forex currency pair declined 40 points in a very short time span from just 1.3766 to about 1.3726, so if you had sold £20 a point at 1.3766 (assuming the provider’s spread was 1.3766 – 1.3767) and then bought back at 1.3726 (spread of 1.3725-1.3726) you would have made £800 (1.3766 – 1.3726 x £10). But what makes the forex markets? The foreign exchange market has no central exchange that opens or closes, so as a spread trader you are using the prices that banks and other FX traders are using to buy and sell currencies around the clock from early Monday morning to late Friday night. That’s right… currency trading is available 24 hours a day, five days a week which means there is no such thing as overnight risk in the currency markets. The forex market is also the most competitively priced and is highly leveraged which means that its crucial that you keep abreast of market happenings. The main participants in the forex markets are central banks, corporations, hedge funds speculators and private traders like us. The nice thing about the currency markets, however, is that there is always going to be a currency going up and another going down, irrespective of what’s happening in other financial markets like shares. As such there are always profitable currency trades to be had be it whether your trading horizon is measured in minutes or weeks! Also, since the forex markets is a true 24-hour market with big volume and tight spreads which means that it is not susceptible to the same shocks as individual equities with price gapping much less common. Spread betting on currencies can also be a little different from most other forms of spread betting. Currency spread bets can be divided into two types, spot currency bets, and forward currency bets. Spot bets are mainly used for short-term trading, such as intraday, and forward bets usually trade on a standard quarterly contract and are suitable for long-term dealing. “Currency trading is also referred to as the foreign exchange market, also known as forex or FX and the most popular spread betting markets within the foreign exchange tend to include the GBP/USD, EUR/USD and USD/JPY cross-currency pairs. It doesn’t really mean much to say that one currency is undervalued – or overvalued for that matter. A currency of a certain country is traded against a currency of another and sometimes that value tends to increase, while at other times it decreases. Also, there’s no way to find out what the ‘fair value’ of a currency ‘should be’ so it is nonsense to say whether the present value is above or below the ‘ideal value’. Obviously the exchange rates and/or inflation level of a currency are important and can have profound effects on global economies. For instance a very low Yuan (in relation to the dollar) means that USA residents (or anyone with dollars for that matter) will find it inexpensive to acquire products from China. On the other hand Chinese people will find that buying things from America are too expensive for them. This can move investments from one nation to another while altering consumption patters around the world. Most people tend to trade and exchange currencies only when changing money on holiday. However, currency trading also represents a good alternative market to trading stocks and shares. In fact, the fast-moving currency markets provide intraday spread betters with a perfect mechanism to trade the news headlines of the day. The currency markets are also very sensitive to any economic announcements that might affect the countries’ respective interest rates, or the relative strength of the economies within the a currency pair. This includes any new data on debt issuance, national debt and inflation expectations. For example, Shares Magazine quotes a good example on 2 March in the EURUSD pairing. This closed almost 100 points higher on speculation the European Central Bank (ECB) might raise interest rates at its meeting the following day to head off the threat of higher inflation. In 2010, it was the euro that was in spotlight – what with massive country deficits in member countries like Greece and Ireland putting a question mark of what could happen to the euro if one of the countries were to default. However, this year it seems like its China and the Middle East that are making the headlines. Every time you trade currencies, you are trading one currency’s value against another i.e by using a currency spread bet, you are backing one currency against the other. Nobody talks about the forex exchange market being up or down, because whenever a currency is losing, another is winning. For instance, you can’t open a trade on the US dollar, but only on the US dollar combined with another currency, such as the Euro/US dollar (EUR/USD). So you have to be careful which way you are trading, that is which currency you think is strong and whose value will grow against the other. The rule is that if you think the first named currency is strong and increasing in value, you “buy”, if you favour the second currency then you “sell”. So the way to profit from foreign exchange rate movements is to short the market and bet that one particular currency will keep falling, or rising against another currency. When trading euro-dollar for instance, your first currency is referred to as your base currency. For example in the euro-dollar cross, when we mention that the pair is trading at 1.4320, this is the amount of dollars to the euro, or that one euro will buy you $1 and 43 cents (20 is four decimal points). Currency trades are denoted as pairs of three-letter codes with each currency traded in the market being represented by a three letter code. For instance sterling is quoted as GBP, while the Euro appears as EUR. So what would a quote of GBP/USD of 1.61102 (quoted as 16110.2 in spreadbetting terms) on your spread betting screen mean? The price next to the GBP represents the number of USA dollars that could be bought with one pound. If you then bought or went long GBP/USD, you would be doing so on the expectation of a gain from a rise in the pound. If you sold it, you would be backing the dollar to strengthen against the pound (the number would go down as less dollars would be needed to buy a pound). Spread betting produces profits from the changes in currency pairs by making use of margin without actually owning the currency contract. When you spread bet, you bet a certain amount per point and the fact that you are dealing in foreign currencies does make any difference. In fact one of the advantages of spread betting on currencies as opposed to trading the underlying spot rates is that all profits and losses will be in sterling rather than the forex pair’s base currency, which makes accounting easier. For the currencies above, you could buy at £10 per point. Some spread betting providers allow you to hold accounts in other currencies, such as the US dollar, but this really doesn’t matter to the way you place a bet. The typical minimum bet is 50p a point with the initial margin in the region of 40 times the stake. Just as with a stock, spread betting for forex trading offers you a quote, which consists of a “bid” (selling) price and a slightly higher “offer” (buying) price. Which brings us to the question of what a “point” is in the Forex markets. A point is the last quoted digit, usually the fourth decimal place, of the exchange rate. At the time of writing, the EUR/USD is quoted at 1.3905. If this changed to 1.3910, that would be an increase of 5 points. If EUR/GBP was priced at 0.8657 – 0.8659 that would mean that the euro is worth just over 86p and an increase to 87p would represent a 41-point move. There is a number of forex pairs to trade (although most of the volume is concentrated to dollar crosses), including the Australian dollar, Canadian dollar, yen, Swiss franc, pound sterling and euro. The initial investment is small. The forex market is a large market where the volume of currencies traded is worth trillions of dollars making it very easy for you to enter or exit the market with ease. This is a big advantage which is missing from small-cap stocks which can make it hard for you to exit at the price you want. Currencies are a mirror of the health of a nation’s economy and this together with the high liquidity and freely available information makes it harder to manipulate and it is much less prone to insider trader, as can happen with individual stocks. Forex trading trades round the clock or 24 hours a day. The forex market is highly volatile. Large fluctuations in forex prices can translate into good profits. The forex market as a whole can never be in bull or bear phases as this is simply an issue of balance. If one currency is rising (bull), then at least one other must falling (bear) for it to be doing so. Currency markets tend to follow trends. This may not always be the case with shares in falling or turbulent market conditions where it can be more difficult to find a clear upwards or downwards trend for trading. Currencies are never delisted even though a currency might fluctuate wildly. However, countries will always need something to exchange for goods and services. On the downside expected returns don’t exist in foreign exchange trading, because as opposed to shares, for example, currency doesn’t pay dividends. And there’s quite a difference between trading on emotional highs vis-a-vis computer-driven systems. Another risk is that during periods of crisis, currencies can depreciate by as much as 25% or more in a very short time (hours) although normally the fluctuations are 1/2 percent to 1 percent per movement. The risk is high because of the high volatility which is why it is so important to control the exposure through stops and diversification. Also, keep in mind that for every winner in forex, there is a corresponding counter-party loser. It is particularly important to accept that you won’t win every trade with forex trading. That’s where the discipline comes into the equation, as you need to know when to get out (and ideally have a stops in place). You might only get 50% (or even less) of your spread trades right but you can still make money. What is important is that you make sure that your winning trades are 3 or 4 times the amount of your losses on the top side. Say you had £10 and you put a stop loss in at £9, but if your trade comes right you should be looking at £13 to £14. Sounds about right. Busier when the London and NY sessions coincide. UK morning and afternoon tend to have a different pattern, probably because of NY coming on board. You might want to be watching earlier than 09.30 though, if you have the opportunity. UK evening trading session tends to be a bit thin, then things get a bit busier overnight in the Asian session, but I wouldn’t suggest trading it unless you like the graveyard shift. While trading Forex, it’s worth keeping an eye on oil, gold and the major stock market indices even if you never trade them. Forex trading is offered by virtually all spread betting providers these days. Private investors typically trade on margin accounts, meaning that they put up a small amount of cash and get leveraged exposure to a currency market movements. The natural advantage of this is that it provides for investors to make sizable bets on the market for a fraction of the real market exposure they are taking on. You may often have heard newsreaders announce prices such as ‘pound against the dollar’ or ‘the dollar is worth … euros’, but what does it all mean and how can money be made from currencies? The foreign exchange market is probably the most important of all the financial markets. Being the biggest, the amount of business carried out each day is incredible. Also known as the Forex, or FX market, it provides a vital service for people and businesses that need or want to swap currencies. The most common users are exporters who need to convert foreign earnings into pounds sterling, tourists when travelling abroad and on a greater scale, investment managers who buy and sell currencies as they move assets around the world. Although millions of pounds, dollars etc. passes through the market each day from commercial activity, this only accounts for about 15% of the total passing through each day. The remaining 85% or so is purely speculative, made up of investment banks, brokers, hedge funds and alternative assets funds etc., all gambling billions of dollars on fluctuations in exchange rates and looking for extra return over the market. Minor currency pairs to be highly volatile due to their low liquidity which creates both opportunities and extra risk. Most exotic currency crosses are traded against the USA dollar although sometimes a few are paired against the Euro particularly for those countries that are looking into joining the euro like the Polish zloty or the Hungarian forint. And exotics like the USD/BRL, USD/CNY or USD/RUB are definitely not for the unwary or the faint of heart; to trade such currencies you would do well to acquire some previous experience. But what drives the currency markets? The main drivers include interest rates, economic expectations, trade balances and geopolitical risks. Currencies are particularly sensitive to interest rates, so the markets are prone to move sharply following the release of release of interest rate opinions or decisions. Over the long term, economic forces control currency rates. But over the short term, speculative activity can have a major say in things. One notable occasion was back in 1992 when sterling crashed out of the ERM. The Bank of England threw billions of pounds at the market in a desperate attempt to fight off speculators. The end result was a devalued pound and millions of public money transferring to mostly foreign speculators such as George Soros. It’s reported that he made £600 million in a matter of days! 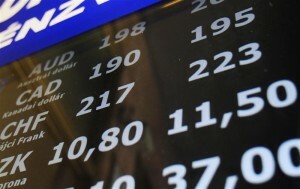 So how can the smaller investor make money from the currency markets? Well, the smaller investor has the freedom to take a much longer-term view of the markets – and in these situations it pays to wait for a major key level to be reached before getting involved. City traders on the other hand are constantly under pressure to make profits. Private traders in this respect have one advantage here over professional players who are employed to be active and so are more likely to feel the need to be ‘doing’ most of the time, to justify his or her salary and bonus. Most traders however tend to take a short-term view. By doing this, they deal in vast sums and make a profit from very small percentages/movements. Charts play a particularly important role in currency trading. You can obtain charts from many of the spread betting firms, or you can view them on many internet sites. One very good site is www.bloomberg.co.uk where you’ll find every conceivable chart. Another is www.bigcharts.com, and also www.tfc-charts.w2d.com. Similar to other markets made available by spread betting providers, forex pairs have spreads and different margin rates with the narrower spreads being a quality of the more liquid currencies, i.e. those that are traded in big volumes globally (referred to as the currency majors). These would include the USA dollar and the euro, the Japanese yen, and the British pound in particular the GBP/USD, EUR/USD and USD/JPY currency pairs. Euro/US dollar is the most liquid and heavily-traded pair and naturally bets on sterling are the most popular with UK clients. 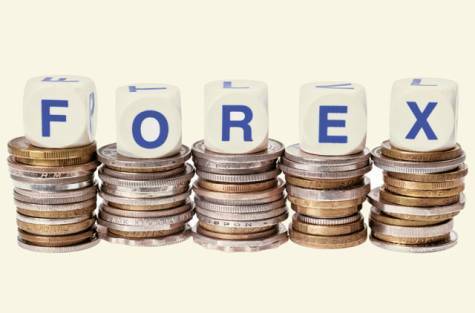 The most popular longer-term forex positions tend to be in USD/GBP, EUR/USD and USD/JPY. In fact according to the Bank of International Settlements the dollar is involved in 85% of currency trades, followed by the Euro (39%), the Japanese Yen (19%) and the British Pound (13%). This means the USA economic releases tend to have the most striking impact on the foreign exchange market. For the more popular traded currency pairings, such as Euro-Dollar or Pound-Dollar crosses, the price range tends to be relatively small. The euro for instance may rise from $1.37 to $1.65 over a 6 month period, offering limited opportunities for gains. The high trading volumes however help to keep both spreads and fluctuations minimal in much the same way as with a blue chip stock. However, spread betting firms quote fractional changes to the forex rate with more to the right of the decimal point which accentuates the movements. Other popular traded currencies are the Canadian dollar and the Australian dollar, which dependent to a large scale by the prices of the vast natural resources riches largely present in both countries. When the prices of commodities and minerals are going up, their currencies tend to perform strongly against the currencies of other countries. Similarly, their currencies tend to underperform when commodities prices decline. The Norwegian krona is another currency that sees a lot of activity; this currency is affected to a large extent by the oil price, as Norway is one of the bigger oil and gas exporters. Likewise the Swiss franc (CHF) attracts sizable volumes; it often being regarded as a safe haven’ currency: traders will buy it against another currency during times of market crisis, when investors are more wary of investment risks. This is because Switzerland as a country is traditionally considered as politically stable and fiscally prudent. The two basic tools used by most forex traders to study the foreign exchange markets are fundamental analysis and technical analysis. Fundamental analysis is about the macroeconomic factors behind the currency markets ranging from USA unemployment figures to the Bank of England interest rate policies. Generally speaking the more important economic releases for any country include: Unemployment, Interest rate decisions, GDP, Retail sales, Inflation (CPI or PPI), Industrial production, Business sentiment surveys, Consumer confidence surveys, Trade balance and Manufacturing sector surveys. Technical analysis on the other hand studies price movements and in particular repeated patterns in the financial markets and the first step here is to find out whether a currency is currently trending up or down. Add to that the fact that the foreign exchange markets is practically open 24 hours a day, 7 days a week and the considerable liquidity and leverage possible and it doesn’t come hard to realise that this is one of the preferred markets for day traders who utilise short-term strategies in attempts to extract some quick profits. For foreign exchange and forex trading in particular, technical analysis is incredibly important, with so many forex traders following the same numbers and triggers and basing their strategies on what they see in the charts, technical analysis can have a self-fulfilling prodigy element that is stronger than in other markets. Some investment banks even make use of quant trading strategies that are based mostly on technicals due to the historical price movements. When trading you also have to keep a constant balance between profit potential versus risk for each possible trade you are considering and charts are good tools to gauge this particularly for working out where to place stops and take profit orders. Charts allow you to check at a glance useful information such as high/low of the day, the volatility of a particular currency pair and potential resistance levels that might stop a price advance. In fact fundamental analysis is often too slow to alert you when market dynamics are changing. Technical analysis also helps to eliminate emotional attachments as it pushes you to take a more disciplined approach to your trading. Most traders prefer to use a mix of fundamentals and technicals; using technicals mainly to find out suitable entry and exit points for trades or to determine trends. Trading currencies basing yourself solely on fundamentals is possible but you would need to have lots of capital and persevering/staying power. The forex markets is certainly one that follows the rule ‘The market can stay irrational longer than you can stay solvent’. Nevertheless, it is worth keeping in mind that nobody can control the forex market and the currency markets can be quite volatile so its important to utilise stop losses. In particular it is important for private traders – the neophyte and the more experienced – to realise that foreign exchange markets can and do move unpredictably and irrationally ‘in the blink of an eye’ particularly with economic releases which can make the short period before their announcement the subject of much speculation for traders. A stop loss will help to limit the downside – it will will close the trade if markets have moved too far, too quickly. Despite the reality that more and more people are using automated forex trading systems, they don’t have the capacity to control the market. One thing to keep in mind is that when you are speculating on a company’s share price, you are effectively focusing on a company’s balance sheet, its trading performance and the quality of its management. When spread betting on forex, you are focusing on countries’ economies, this would include such things like to what extent are governments borrowing and spending and their interest rates levels. That’s why spread traders pay close attention to statements and notes circulated by central banks as interest rates can have a big impact over currency prices. Central bank intervention can and does move the forex markets – the difficulty here being that such events are very hard to predict and trade. Currency markets are also very responsive to interest rate expectations, and with interest rates in the major markets being so low, currency speculators are pouncing at the first hint that one of the major central banks will decide to implement an interest rate hike. Apart from interest rates and government borrowing, other variables that are important include unemployment and inflation figures which can lead to sharp currency movements. For instance, in 2010 even though the European Central Bank kept euro interest rates steady, the Greek crisis and the fears surrounding a number of eurozone economies put the currency under pressure. With a spread betting account, you would have been able to get access to a number of currency pairs allowing you to trade the euro against another currency, such as the USA dollar, pound sterling, Japanese yen, or even the Swiss franc or New Zealand dollar. The idea here is to cross-match the euro, while it was weakening, against a currency that was performing better in relative terms (like the yen, for instance). Likewise, efforts by other eurozone countries to build a rescue package have given support to the euro. Economic data, political decisions, social unrest and more also play a part in the price movements of currency pairs. Technical traders might argue that it is not worth considering the fundamentals, because they’ll take a very long time to work through the underlying market – however they will ultimately impact the direction of a currency pair and need to be taken into account. Technical analysis is not infallible and no technical indicator is fail-proof and what works for a period of time can suddenly stop working. In any case it is well possible to use both approaches for trading and with currencies in particular it is a mistake to disregard the fundamentals as market news and economic announcements have the potential to cause huge volatility in the currency markets. In fact technicals are best used to spot and follow trends. Taking the case of the Euro for instance – a weakening European economy will put pressure on the single currency versus the dollar but technical analysis can help you refine and analyse just how far the currency might fall when it starts to retrace. There are a number of strategies one can utilise when spread betting foreign exchange including momentum or reversal strategies. Most traders will look for chart patterns looking for prior resistance levels which have now become a new support level (and vice-versa) while the most important reversal signals include head and shoulders reversal patterns and failed breakouts. One of the most commonly used trend indicators in forex trading are moving averages. These serve to chart the rolling average price of a currency pair over a particular period of time, typically 50, 100 and 200 days. Moving average can provide a useful indication of a currency’s direction and momentum; when the short term moving average rises over a longer average, it would normally be a bearish signal (and vice-versa). The key thing here is to stick to the trend. While a cross-over of moving averages might not make a trading system per se, it normally indicates a change in trend direction and loss in upside or downside momentum. Another common trend indicator is the RSI (Relative Strength Index). This is a measure of the relative strength of a market over time and fluctuates between the values of 0 and 100. An RSI value great than 70 is usually a sign that a market is overbought. A value lower than 30 indicates that the rate has done the opposite and is oversold. Other common technicals commonly monitored by forex traders include MACD and ADX which help measure the strength of a particular trend. There are lots of private traders who deal in foreign exchange and trade using a traditional forex broker, however in the United Kingdom most people prefer to trade using a spread betting provider instead. Spread betting the forex markets is very straight forward, although it can be slightly difficult to understand if you are new to spread betting. There are two forms of currency spread betting: The first is the value of a currency on a future date, and the second is a daily rate spread also known as a ‘on the spot’ rate which is intended for very short-term trading. The spread price for a daily rate currency is much lower that a future date price. At the time of writing, the financial bookmaker will quote a 24 point spread as opposed to a 40 point spread for future rates. If you imminently expect a big move in the markets, then a daily rate is best. But I must stress that it has to be a big move. Even a move of 24 points in a day is fairly uncommon but a 40 points plus movement over say a couple of months is much more likely. You can bet on any of the world’s major currencies, but the pound sterling, US dollar and Japanese yen are the most commonly traded. Additionally, you can also bet on cross rates between different currencies. This calls for knowledge of two different markets. New traders would do well to stick to one or two currency pairs, using the USA dollar as an anchor since the dollar is involved in the majority of forex trades. Clever Strategy : There is a slight difference when trading currencies as opposed to the FTSE indexes. When the dealer quotes a price for buying (up bet) then you are betting that the first-named currency will strengthen. When you sell (down bet) then you are betting that the first-named currency will weaken. For example : If you buy pound/dollar then you expect the pound to strengthen against the dollar. If you sell pound/dollar then you expect the pound to weaken against the dollar. My advice for you is to forget daily rates initially and concentrate on longer-term prices. The best approach is to try and spot a developing trend and stick with it over a number of months. It is also good practice to always calculate the amount you are risking on any one trade. That way if there’s a loss it’s controlled. The maximum loss that you should take on each trade shouldn’t exceed 2% – 5%. This is money management and it’s crucial part of the trading setup. Don’t enter trades that don’t meet certain criteria, especially reward to risk ratio of 3 to 1. Finding Opportunities: IG Index has a free Forex Focus section on its website that anyone with an internet connection can access. This features twice daily forex commentaries as well as regular twitter updates and constantly updated charts and Bloomberg median forecasts. Interestingly, a recent report from research specialist Investment Trends recently revealed that 51,000 of 67,000 forex traders surveyed choose to trade through financial spread betting as opposed to CFDs. Forex trades made up 42% of financial spread betting activity in 2010 – a rise of 6% on 2009. The reason for spread betting being a more popular trading medium than CFDs for forex trades are various and include the cheaper transaction costs offered by financial spread betting, tax efficiency (spreda betting being exempt from both Capital Gains Tax and stamp duty) and the fact that spread betting transactions are denominated in your local currency (pounds sterling in the UK). This is not the case with CFDs, which are traded in their native currency.